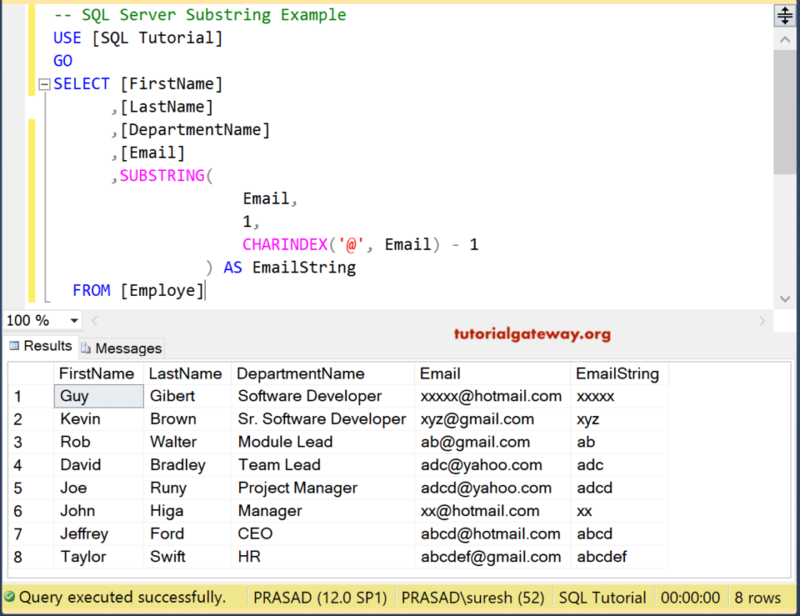 The SQL SUBSTRING function is one of the String Function, which is used to return the specified number of characters from the given expression. 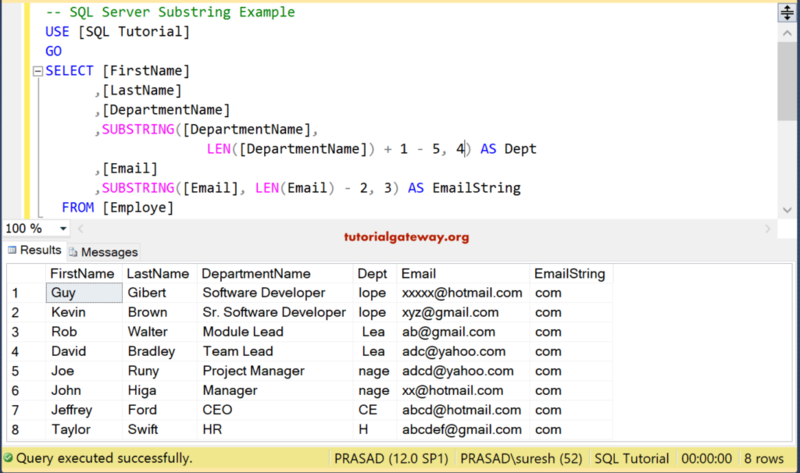 The Sql Server Substring function uses its third argument to decide, How many characters it should return. 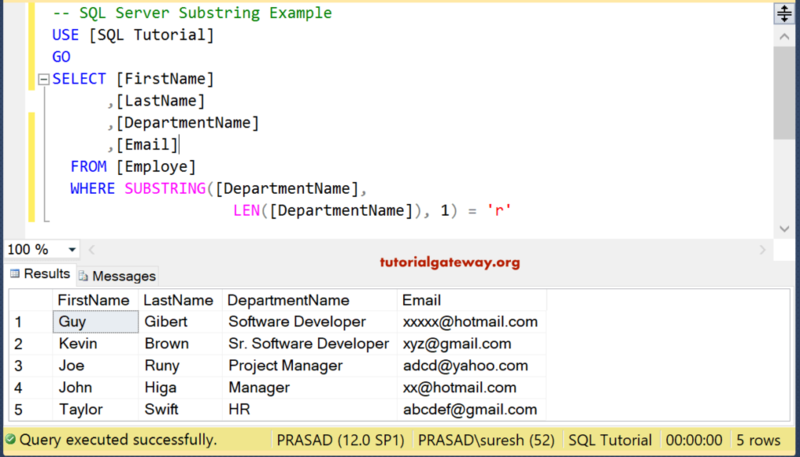 TIP: SQL substring Function will work on characters, images, text and binary. Expression: Please specify the valid Expression on which to want to return the characters. Starting_Position: Please specify, from which index position you want to start selecting the characters. Length: Please specify, how many characters you want to extract from the Expression. 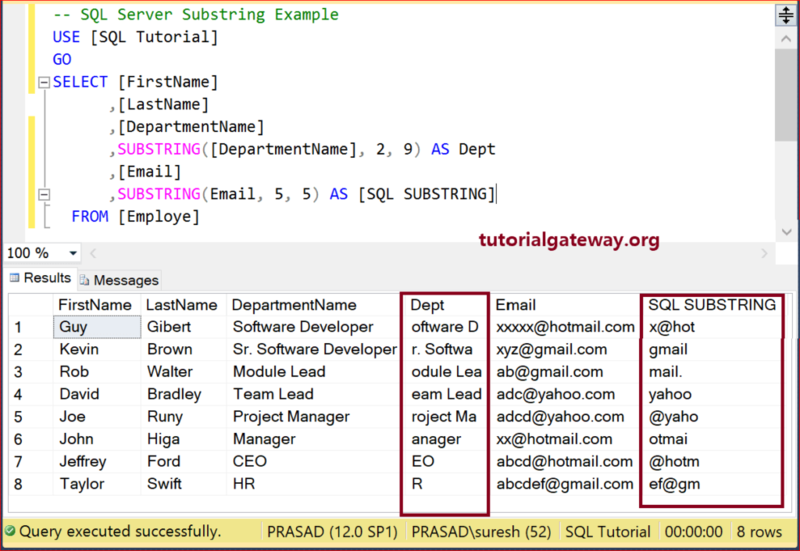 The Sql Server Substring Function is used to return the specified number of characters from the given expression. 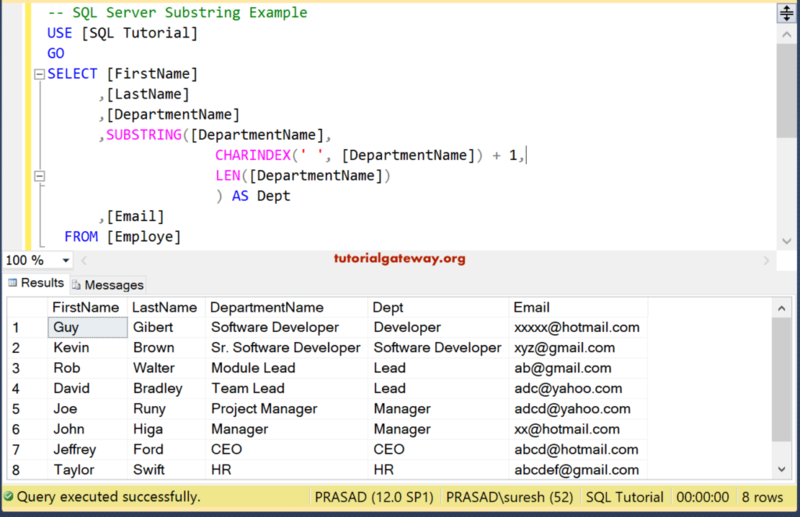 The following query will show multiple ways to use the SUBSTRING function. Below lines of code is used to declare a string variable and assigning the string data. In the below statement, We used the String substring in Sql Server to start at index position 1 and return five characters from the @Character_Expression variable. 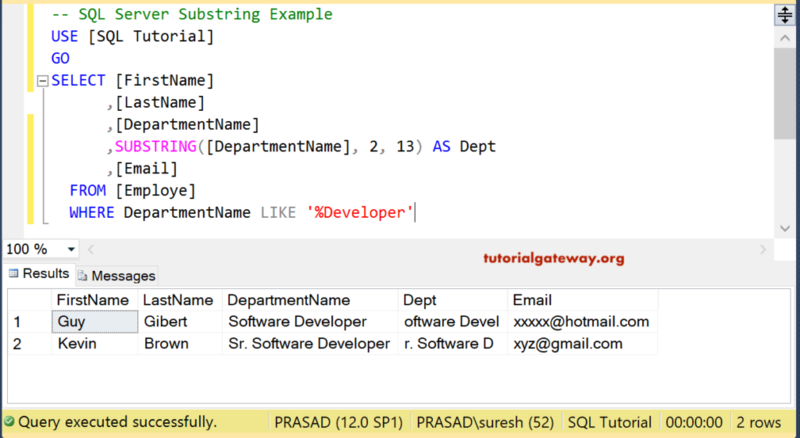 We also assigned a new name to that result as ‘SQL SUBSTRING using ALIAS Column. In the below statement, We assigned starting position = 20, which is greater than the string length. So, SUBSTRING function will return Empty string because there is nothing to return at that position. 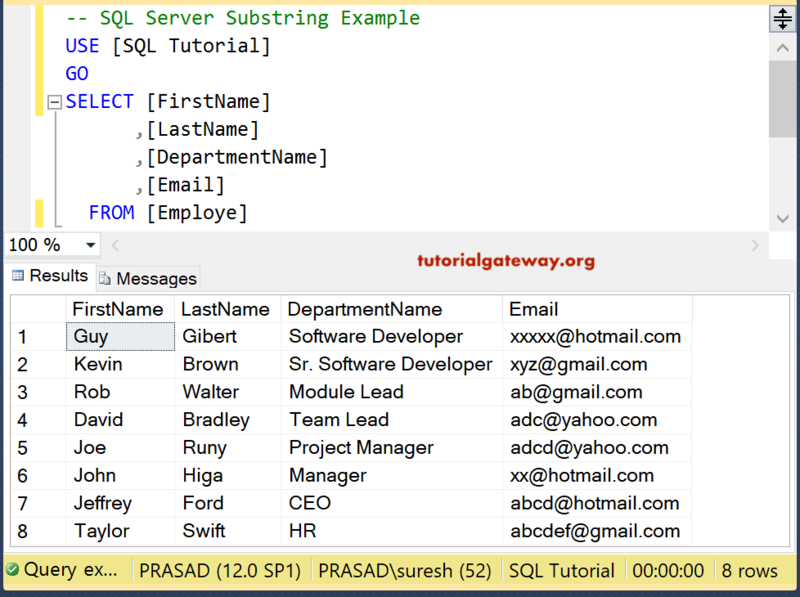 The SQL Server SUBSTRING function also allows you to select a required number of characters from the column values. 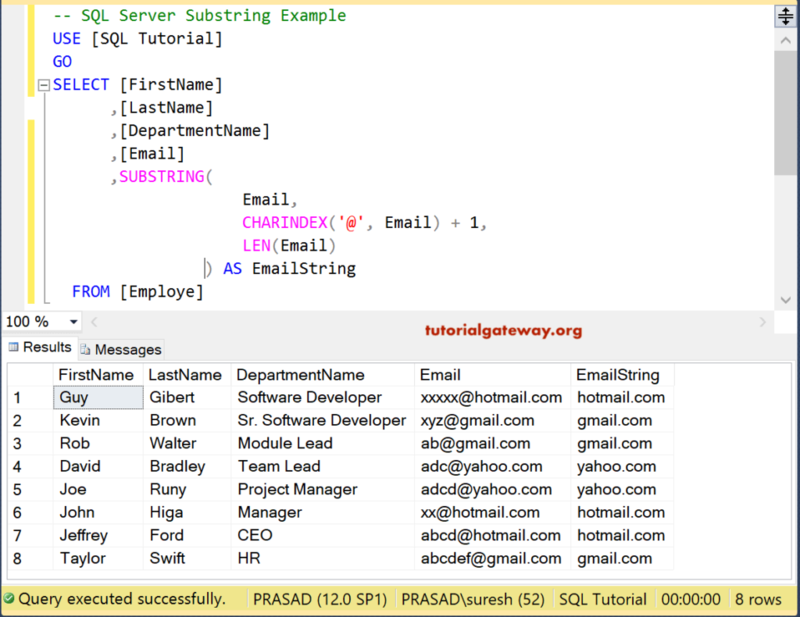 In this example, we used Sql Server Substring function on both Department column, and Email column. If you observe the above result, SUBSTRING Function is not getting the domain names perfectly because we are using a fixed value. In the next example, we will show you, How to use dynamic value as a second and third argument to return the domain names accurately. 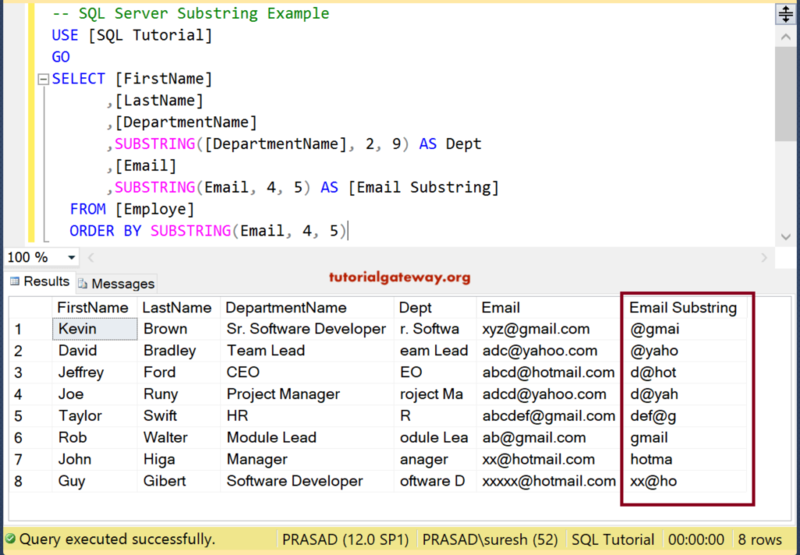 In this example, We are going to find the domain names present in Email column using SQL SUBSTRING Function. Below statement will return the index position of the @ symbol. It means CHARINDEX Function will check for the index position of @ symbol in each and every record. Next, We added 1 to the index position because the domain name starts from next position. On whole, Substring will start at the index position after the @ symbol and Ends when the string ends. In this example, We are going to find the string before the @ symbol in Email Address column. In this example, we used the Like Operator to restrict the Substring function result few records. Below statement will find the substring of all the records whose Departname ends with Developer. We can also use this Substring function inside a Where Clause. 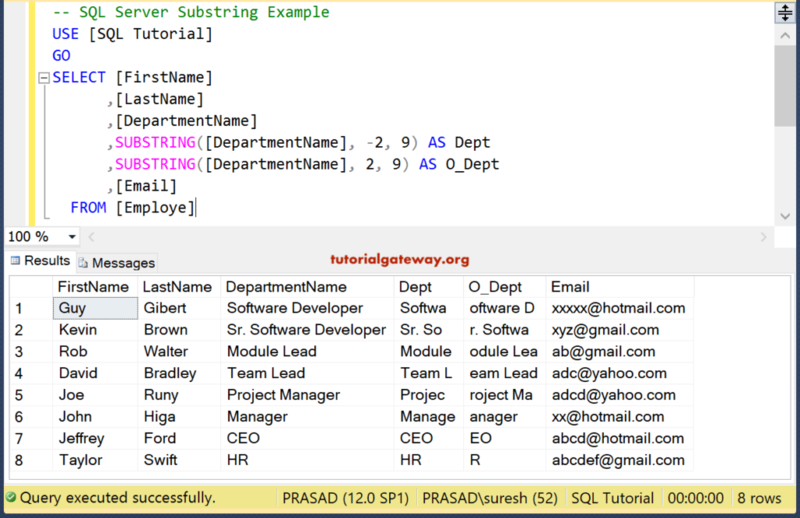 Below statement returns all the records from Employee table whose Department name ends with r.
In this example, we used the Sql Server Substring function inside an Order By Clause to sort the data using this substring result. Below statement will sort the records using the substring of Email starts at index position 4 and counts 5 characters from there. 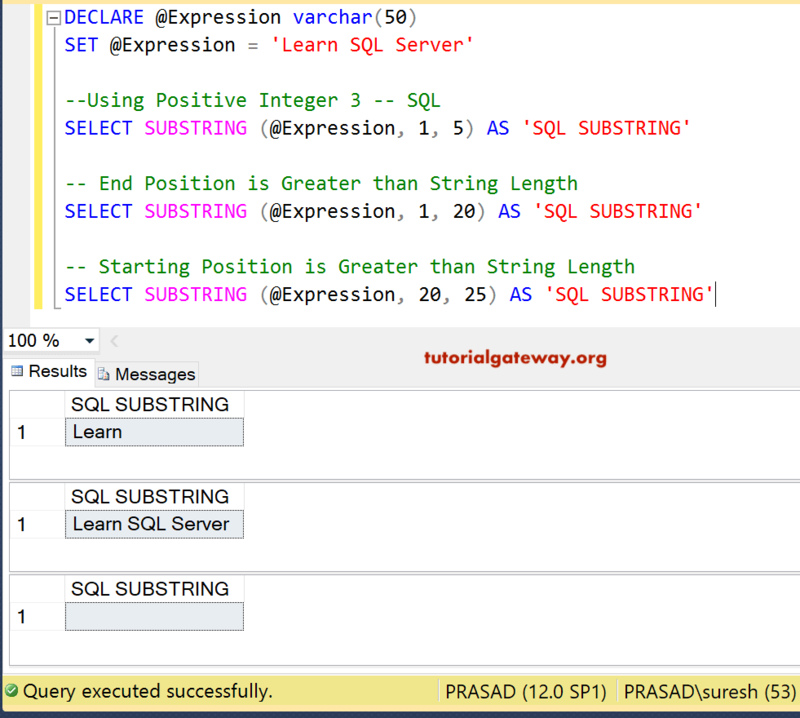 The String Substring in SQL Server also allows you to use negative Index but it might not make any sense. 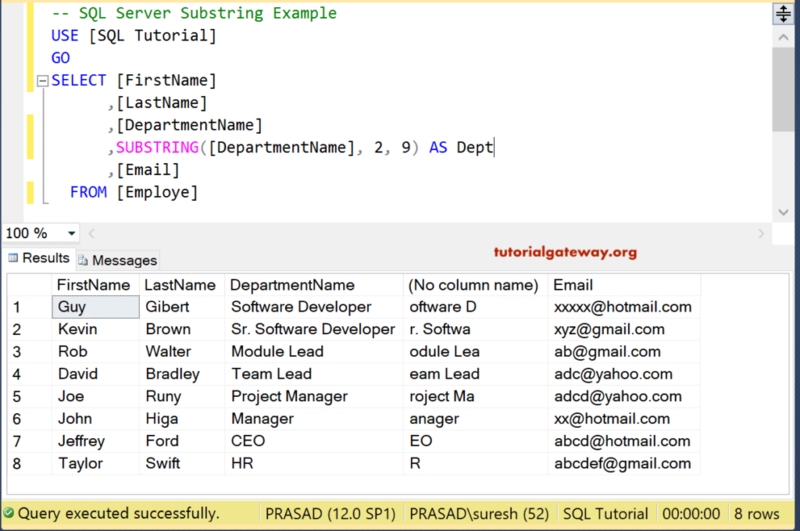 This Sql Server Substring example helps you understand the process of writing the last 3 characters, or last four characters etc. We will take one record i.e., the first record from Email column to explain the output.